Yesterday, according to "Cadena Ser", a spanish media newspaper, there are problems between Cristiano Ronaldo and Casillas. The newspaper defend the thesis that it all started when Casillas's girlfriend, Sara Caronero, called Ronaldo "egoistic" and "individualist", in a TV show back in September. Apparently, Ronaldo was upset with those comments, and sent a text message to Iker expressing his disgust at the whole situation. Iker then replied: "Sara is a journalist and she was just doing her job." 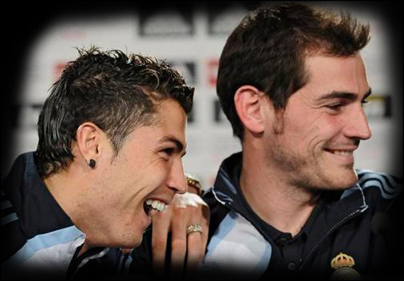 It has been said that Ronaldo and Casillas relationship has never been the same since that incident. Reports say that Florentino Perez along with Jorge Valdano and Miguel Pardeza, took them both into an office and replayed the video to explain to Cristiano that Sara had been misunderstood but Ronaldo wasn't convinced with it all. Since then, they've not been seeing eye to eye. This spanish newspaper still adds that Ronaldo relationships inside Real Madrid's locker room are "reduced" to Pepe, Marcelo and Di María. This brings another topic to the table, on which Ronaldo feels the lack of support from the rest of his team mates, when it comes to defend and protect him on the pitch against insults, boos/whistles and harsh tackles. Ronaldo7.net gathered this information from several sources, but wants to remind the fans that at this point, this is just speculation being made from the spanish press, so please don't jump into precipitated conclusions.